Josh Spece of Independence gave a presentation on backyard ponds at the Larry and Shirley Rettenmeier home Wednesday as part of the Cascade Public Library's summer program. Josh, a paraplegic since birth due to a form of Muscular Dystrophy, has overcome his disability with the help of his mother, Sue, and has found ways to pursue his dreams. He began by helping in the family vegetable garden, and encouraging his mother to plant more flowers in their yard. Eleven years ago they put in their first water garden and have since added two more on their property and placed four on Josh's grandparents land. When Josh graduated from High School four years ago, he and his mother opened "In the Country Garden and Gifts." The store carries water and land plants, floating plants, some fish, pumps needed for water falls and fountains, and ponds liners. Sue manages the gift shop portion of the store, which includes lawn ornaments, garden art and flower pots. Josh attended Hawkeye Community College while operating the business and graduated last year with a degree in Horticulture. Even though he cannot perform all the tasks of pond installation, he enjoys helping with the planning and planting, and as much of the other work as possible. "When Josh decided to pursue a career in horticulture and open his own business, I supported him in that. In the Country Garden and Gifts has given us a chance to work at home, which is good for me as well because I have two other children in wheelchairs due to the same condition," Sue said. Josh utilizes computer software to draw up the plans for a water garden and determine which flowers should be planted. If his clients do not know what type of pond they prefer, or where it should be places, he will travel to their homes to make recommendations. During Wednesday's presentation, he made several suggestions for people interested in installing a backyard pond. The actual pond should be on flat land or built up so water does not seep out the lower side. Hillsides are beneficial for those who want a waterfall, but the dirt that is removed for the pond can be used to create an artificial slope. A spot away from trees and in the sunlight is usually best, because leaves into the pond require frequent maintenance, and tropical plants need at least six hours of sunlight per day to thrive. The Rettenmeiers installed a pond using supplies purchased from In the Country Garden and Gifts, but they chose to create the design themselves. "It was hard work, but it was fun too. My wife wants to put in another pond with a stream running to it from the first one, so that will probably be next year's project," Larry said. Their pond is six feet by 11 feet and 40 inches deep. It contains koi, a large frog and several floating plants. They enjoy the sound of the waterfall and watching the animals that are drawn to the water. The pond is accented by a large landscaped area complete with potted plants, a birdbath and some planted flowers. 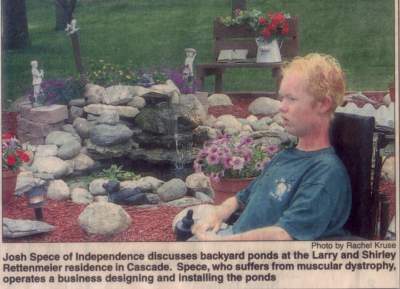 "You should try to put your pond in a place where you can see it and enjoy it," Josh said. "Perhaps by a patio or deck, or someplace near where you spend a lot of time." Fish and plants need to be balanced in order to keep the pond clean, although Josh told people not to worry if their pond gets green for a while, because every new pond does. "Algae feeds off of the nutrients in the water, such as fish food that is not eaten and dead plant leaves that fall into the water and deteriorate. The Rettenmeiers have on of the clearest ponds I have seen," Josh said. The best way to find out what you want in your back yard is to look at other peoples ponds. Josh recommended beginning with only a few fish and about 50 percent of the pond surface covered with floating plants. Josh also suggests that people make the pond as large as possible because it will save time and money later. "Backyard water gardens are the fastest growing trend in gardening, because it adds a whole new dimension to your yard: the sound of water and animals which people really enjoy, and the ability to use plants that you cannot plant otherwise. It seems like people who build a small pond always enlarge it later," Josh said. Josh said that people who do not have a large backyard should consider a container garden. Container gardens can be made in flowerpots or any other object that holds water. Fountains can be incorporated for people who like the sound of running water. Josh's great grandmother has a container garden on the step of the resident care unit where she lives. "If you don't have a lot of space you can get as much enjoyment out of a container ponds as a big backyard pond," Josh said.